Our Wounded Warriors are facing many new challenges in life they had never anticipated. We partner with many volunteers, ranch owners, equipment manufacturers and sponsors to make hunting experiences as simple as possible so our Wounded Warriors can focus on the fun part of the hunt while we worry about the logistics and costs. Our goal is to provide fully supported hunts for big game animals and birds including elk, whitetail deer, mule deer, turkey, pigs, coyotes, pheasant and waterfowl on quality private properties. 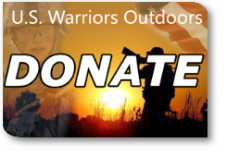 We provide full financial support, logistics, accommodations, guiding and support resources to achieve the greatest experience for our Wounded Warrior men and women.